Ivo loved making these little felt bookmarks for both of his sweet Nanas. He picked out the colors and the stiches and used the foot pedal while I did the needle threading and the steering. He said, "Hey we're doing teamwork Mom." For a Nana who's really on the "mark"
And I thought of one too, sort of a good fit for both of our moms: For a special Nana who probably needs this because she can't go more than three or four pages without being interrupted by someone who needs something from her . . . a bookmark for you!! I'm so happy to report that Ivo is once again interested in doing art. Seeing his supplies arranged in their new environment has made them more appealing somehow, and with the colder weather bringing us indoors more and more, he's made quite a little studio for himself in the breakfast nook. 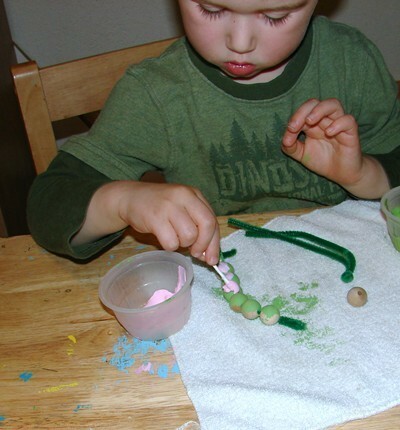 Last week we arranged some "wonders of nature" and set up the paints. How funny that even though there is no real attempt to mimic the forms of these natural objects, their simple presence enlivens the senses and brings the artistic efforts into focus. 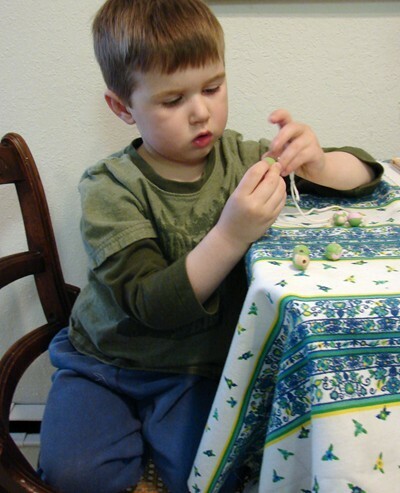 I mostly just painted on the paper, but Ivo filled his paper and was then moved to cover a few shells and a lotus seed head with a beautiful wash of blue. This weekend I'm going to scan through all of my waldorf and preschool art books and try to come up with some good ideas to keep in mind for the upcoming weeks. We've fallen out of the habit of doing our handwork projects, so maybe we can even pick that up again in time for holiday gift giving. I was trying to hold off on the Christmas stuff until after Thanksgiving, but I think if we want to do handmade-by-Ivo gifts it's better to start early and go slow and steady. So if you have any ideas or links to share I would love to hear them! We bring my life jacket, the rowers, and a tackle box. In the canoe the fish swim under my seat. We see a turtle, a line, and a loon. All the fishes that we caught is model. Then we row back to the dock. We tried to make the cover look like an old-timey leather bound edition (it looks better in person than in this picture). The binding is a pamphlet stitch, which is very easy and only requires a nail and some string. Here are some good directions for making a book with a pamphlet stitch in case you want to make your own story. I went back and fixed the links, so they should work now. Thanks for letting me know. These milkweed pod babies were inspired by this amazing post from The Little Travelers. I lovewhat she says about fostering connection, not collection. And that not only makes a lot of sense, but also rhymes. How completely perfect. 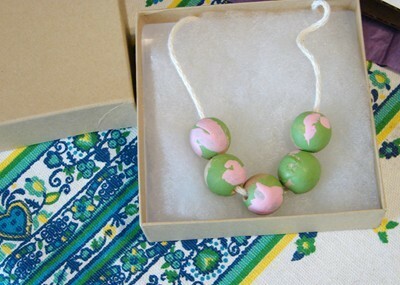 These babes were so simple to make. I just put a wooden bead on an inch or two of pipe cleaner and felted wool roving into a little bundle around the pipe cleaner. Then I added the acorn cap and a little more wool to make the milkweed pod cradle nice and soft. They look so sweet I almost wish they were real. 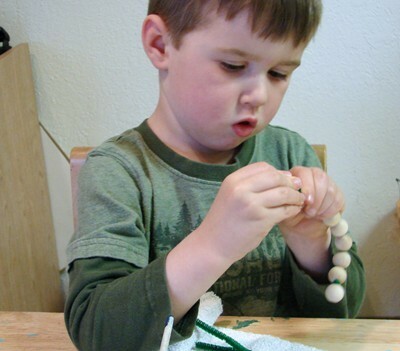 Making a necklace for Nana's birthday . . . Happy Birthday Nana! We hope your special day was full of fun and surprises. We love you! These flowers were so much fun to make and they really turned out pretty, so I thought I would share them here in case anyone else wants to whip up a bouquet of their own. We made these as a group project with five people--two moms and three kids, all three years old but with varying degrees of dexterity. Everyone was able to do all the steps of the project without frusteration, and with beautiful results all around! 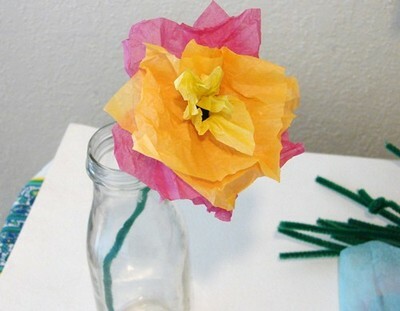 prep: Cut the tissue paper into squares or circles about 3 inches across (it doesn't have to be exact). 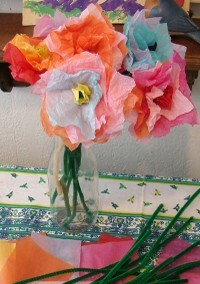 For each flower you will want about five pieces of tissue in varying colors. I cut all the paper before hand and then just put a pile of squares in the middle of the table for the children to choose from when it was time to get started. To make the flowers, take the end of a pipe cleaner and gently push it through the center of the tissue paper like in the picture below. 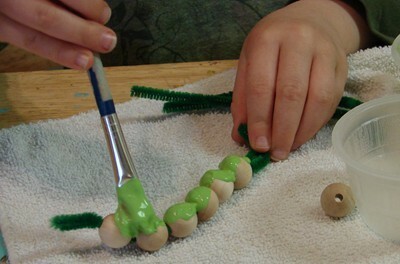 For very young children you can hold the tissue pieces taut for them to push the pipe cleaner up and through from below, that makes it very easy to do. When you have all the issue pieces on the stem, bend the top inch of the pipe cleaner into a little loop, and then use your whole hand to crumple all the layers of paper into one big mish-mash. This has the children amused and befuddled the first time they see it done . . .
And we say, "gee that doesn't look like much of a flower, does it?" But wait and see . 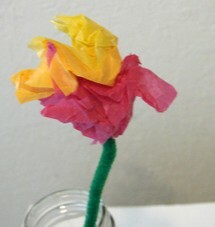 . . You can gently uncrumple the tissue mish-mash and you will discover a beautiful bloom . . .voila! 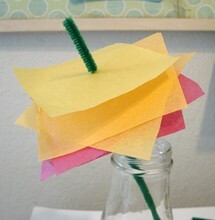 If you want to, you can use a dot of glue at the bottom of each bloom to secure everything in place. A little bead pushed up the stem will also do the trick.